Graduating from school can be one of the most important moments in your life. You want to commemorate your big day with something that you can look back on and cherish for years to come. 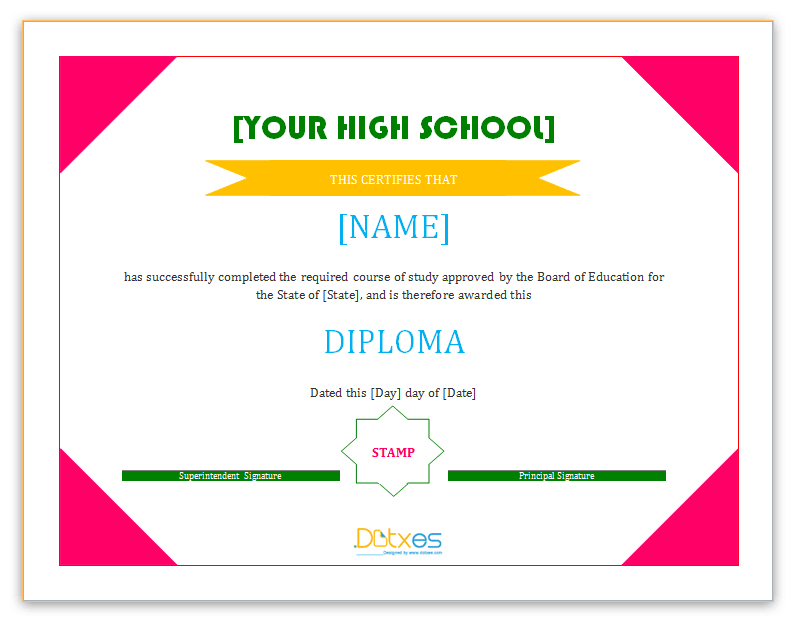 Regardless of whether you are graduating from high school or college, a school diploma certificate can be just the thing you need. Creating the certificate is far simpler than you think. All you have to do is provide the name of the school and the student’s information and we can help you create the certificate of your dreams. The certificate has bright, vibrant colors to make your student’s information stand out amongst all others. You can easily input their name, school, state and more, as well as the seal for where they went to school. Everything will be nice and official when you are done with this template. Don’t worry; if we don’t have the right certificate to fit your needs, we will create one for you. Our team is dedicated to getting you a certificate that fulfills your individual wants and needs. Some of the other main benefits of this template are that it is designed in Microsoft Word®, so anyone with versions ranging from 2007 through 2013 can use it with ease. You can fully customize it, so changing font text, colors and more is a snap. Once you have everything put into the template, you can print it off and have it ready for display in a matter of moments. Look through all of the options available to see which one is going to make your graduate proud to display the achievement for all to see. This isn’t just any moment in their life, so make it memorable.